Switch to the TOUR B XS to feel what its like to gain control, distance, and a decisive advantage over the competition. Feel for more birdies and distance to help your attack the course. The enhanced feel of the TOUR B XS comes from a softer cover as a result of the SlipRes technology. 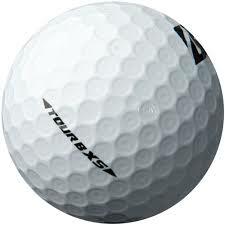 The TOUR B XS gets distance as a result of increased ball speed from the gradation core construction. Tee through green the TOUR B XS is designed to give you an edge on the course. Faster speed and reduced spin off the driver. A more stable hit on our most durable cover. More distance and increased roll. More consistent accuracy, distance and trajectory.